Once fall begins to roll in, it's time to say goodbye to your flip-flops, swim trunks and sunscreen, but you don't need to call it quits on your patio! This outdoor space doesn't have to be reserved for the warm days of spring and summer – it can be utilized throughout the year if you do it right. That being said, outdoor products from Designer Appliances can help you ensure that you can still use your deck or patio, even when the evenings are chilly. Perhaps you're a first-time patio owner and you aren't sure how to keep the party going in your outdoor space. If this is the case, it's never too late to brush up on tips and tricks to make your patio or deck more welcoming as summer turns into fall. Holidays such as Halloween and Thanksgiving can be made more fun to celebrate if you know how to use this area of your house. Here are some ideas and appliances you can use to keep your deck lively all year long. You don't have to go out to a restaurant to get a juicy steak or hamburger if you have the right grill on your deck. This appliance can also give you an all new reason to celebrate, whether it's football Sunday or you want to throw an outdoor barbecue with your neighbors. The Weber Spirit® SP-310 Gas Grill is one item you might want to consider for your deck or patio if you're serious about grilling. This product, composed of stainless steel, operates with propane for a clean-burning cooking solution. It has about 529 square inches of cooking space for the utmost convenience. With three stainless steel burners and rod cooking grates, you can develop delectable dishes for both friends and family throughout the year. One of the biggest issues that will arise when summer comes to an end is cool weather. Chilly temperatures can quickly put an end to your outdoor fun, but you don't have to let the changing seasons put a damper on your favorite area to relax. With a patio heater, you can keep this space lively and comfortable well into the fall. For example, the Lynx Outdoor Patio Heater can ensure that your deck doesn't become abandoned as soon as sweater weather arrives. This post mounted infrared heater has 53,000 BTU output, meaning you can easily stay warm under this lamp and forget it's fall. The product is also composed of stainless steel, meaning it's extremely durable. While it might seem like a drastic, unnecessary change, adding a roof to your patio can do wonders as summer transforms into fall, according to Houzz, an interior design blog. Even if you opt for a semi-temporary solution such as a canopy, adding some type of roof can create further protection from the elements. If you intend to bring an outdoor heater into the space, a roof can also help you effectively trap more warmth and make your space comfortable. It isn't just for roasting marshmallows – a fire pit can be another means of creating heat in your outdoor space when you need it most, according to The Lounge, an interior and exterior design blog. Think about having a pit installed on your patio or deck to bring an additional source of warmth into the area. This will also give you a quaint place to relax when the sun goes down and the temperatures begin to drop. If you want to take it one step further, you might want to think about having an outdoor fireplace installed instead. Not only will this give you a large source of heat, but it will add to the aesthetic of your deck or patio as well. Once the temperature starts to dip outside, you'll want to be sure that everyone on your patio has what they need to stay cozy. Think about leaving some durable, thick blankets outdoors to be used whenever people utilize the space. Make it more comfortable and relaxing with outdoor throw pillows around your fire pit or fireplace. 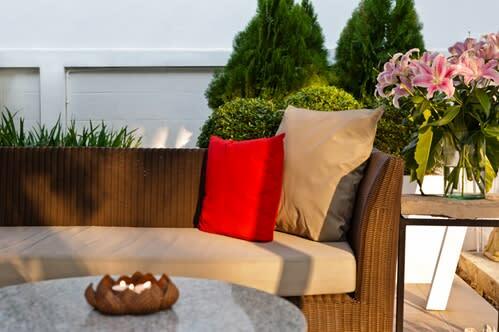 It's these types of final touches that can keep people coming back to your patio throughout the year. If you have stone flooring on your patio, it can be chilly to walk on once fall rolls around. For this reason, you may want to put down a large outdoor area rug to provide more comfort underfoot. This can make the space feel more cozy in addition to keeping your toes warm if you commonly walk around the deck barefoot. By taking some of these key tips into account, you can make the most of your outdoor space throughout the year.